MORRISBURG – The provincial government is doling out the $67,500 toward the planning and design for transforming the area around Morrisburg’s busiest intersection. The money is not new – it was announced in May – but politicians took the opportunity to pull out shiny shovels Friday afternoon for a photo-op against the biting wind and cold as the cheque has been cut for the plan. Local MPP Jim McDonell, SD&G Warden Ian McLeod and South Dundas Mayor Steven Byvelds posed for the cameras. SD&G is also putting in $67,500 while South Dundas is provided in-kind services through its planning department. While the county and South Dundas have done concept plans for sprucing up the area around County Road 31 and County Road 2, this will be a formal design. The work would include traffic and sidewalk improvements, lighting and “traffic calming elements,” which include a roundabout at the the intersection of County Roads 31 and 2. Warden Ian McLeod said the county is looking forward to engaging residents on the design as work progresses and to have a streetscape that works well for residents, businesses and tourists. 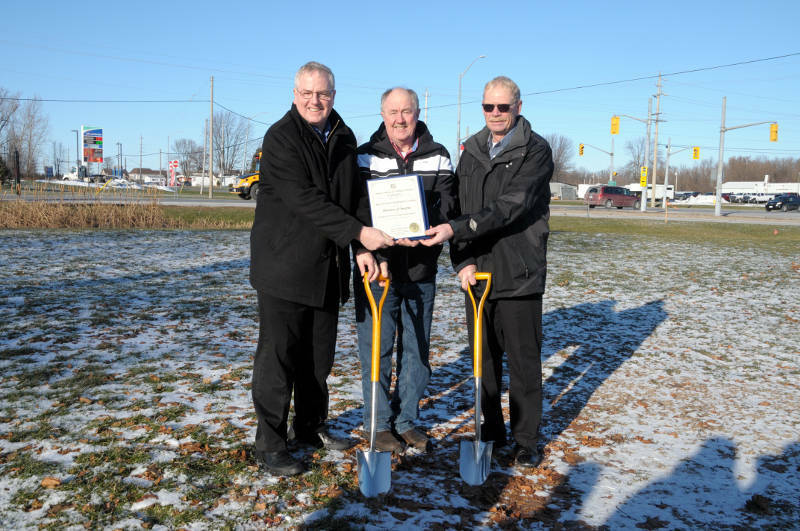 “Based on the resounding success of our roundabout projects in Iroquois and Long Sault, I am confident that a redesigned intersection will better facilitate the safe and efficient movement of traffic, pedestrians and cyclists,” he said. SD&G is one of 80 communities that got RED funding support.